The food counters are a good choice because with these you will be able to sell food in the most organized way. Counters today are made up of different materials and the most common among them is the stainless steel counter. If you buy food counters from a reputed food counter manufacturerthen you will get the opportunity to choose from a wide variety of counters. We are a leading Manufacturer & Trader of Food Counter such as Glass Display and Food Counter. from India. These counters are almost indestructible. Nothing can harm them. You can use them during excessive heat and also during the monsoon season. They also do no get affected at all by the stains. You can put a hot pan on this or spill food colors or even forget to remove the liquids. These stainless steel counters will remain intact and unaffected. These counters are made from the fabricated steels and can be easily recycled. Since this can be reused so it is called a green material. If you want to decrease the carbon footprint then choosing these stainless steel counters will certainly be the best choice. The food counters that are made up of stainless steels look quite chic and clean. If you want to get a counter which has a good quality and is also stylish then stainless steel food counters are ideally the best choice. The biggest advantage of these food counters is that they are resistant to stains. You do not have to worry at all when coffee drips into it or when red wine splashes on these counters. The surface of these counters are made up of non-porous materials and so if these counters get messy you can simply sit back and relax. Since these material are quite safe so the food materials are unable to get absorbed. 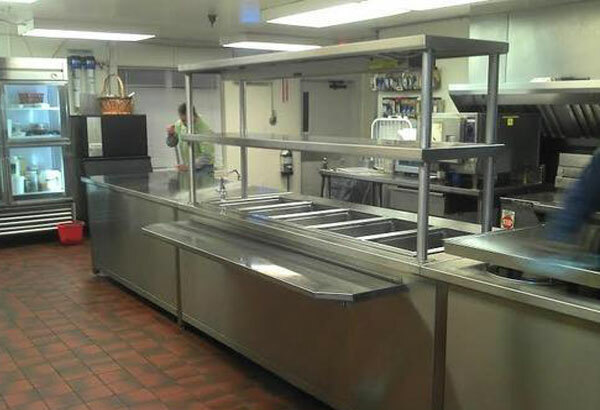 You do not have to make use of bleach or any other harsh materials to sanitize the stainless steel food counters. All that you have to do is to clean the surface and remove the bacteria from it. You can simply make use of a very mild detergent and wipe off the surface.